Diving Ducks: Why the Decline? The Greater Scaup has now joined the Lesser Scaup (which has been here since early September) stopping-over on some of our larger lakes en route to wintering grounds. The two scaups look very similar, with small differences in head size and bill shape (Greater Scaup has a rounder head and broader bill). Males in their winter plumage are quite different from the dramatic black, grey and white of breeding season. Females have a browner plumage with a light patch above the bill. Scaups are diving ducks and in fact, the Lesser Scaup has the largest population of such birds in North America. Large numbers of scaup now stop during migrations to feed on invasive Zebra Mussels in the Great Lakes. Zebra Mussels concentrate a number of toxins, including selenium, which in large quantities could deform or kill developing ducklings or cause health problems in adults. Initial studies showed that scaup indeed accumulated selenium from eating Zebra Mussels. Promising. The Zebra Mussel arrived in Canada as a stowaway in the ballast water of ships travelling through the St. Lawrence Seaway from Eastern Europe and Asia. The Great Lakes provided an ideal habitat for this species to thrive and the Zebra Mussel is now considered one of the top ten aquatic invasive species in North America. People often wonder how such a tiny mollusk can cause so much damage. The answer is found in the remarkable fact that a single zebra mussel can lay up to one million eggs every summer. This extraordinary productivity leads to immense Zebra Mussel colonies that very quickly outcompete and smother native mussels. All of these mussels are also very hungry and their efficient filter feeding removes most of the plankton from the water column. This not only has severe impacts on native food webs but also causes increased water transparency that can create ideal condition for ecosystem problems such as toxic algae “blooms”. Zebra Mussels are usually spread when the microscopic larval form known as veligers hitch a ride in something like a live well in a boat. So, just like we are told not to pick up hitchhikers in a car, a few simple precautions next time you are out enjoying the water can ensure the safety of aquatic habitats by preventing Zebra Mussels from making the trip to a new location! The Zebra Mussel arrived in Canada as a stowaway in the ballast water of ships travelling through the St. Lawrence Seaway from Eastern Europe and Asia. The Great Lakes provided an ideal habitat for this species to thrive and the Zebra Mussel is now considered one of the top ten aquatic invasive species in North America. People often wonder how such a tiny mollusk can cause so much damage. The answer is found in the remarkable fact that a single zebra mussel can lay up to one million eggs every summer. This extraordinary productivity leads to immense Zebra Mussel colonies that very quickly outcompete and smother native mussels. All of these mussels are also very hungry and their efficient filter feeding removes most of the plankton from the water column. 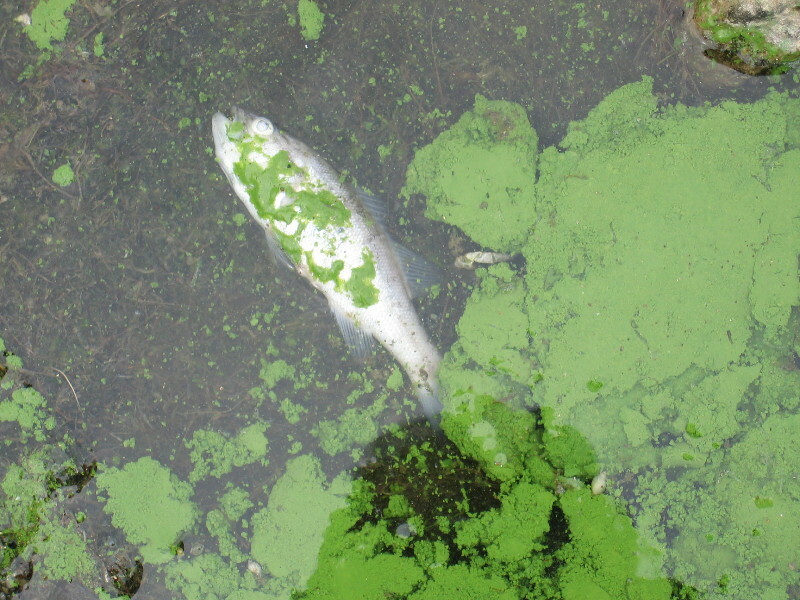 This not only has severe impacts on native food webs but also causes increased water transparency that can create ideal condition for ecosystem problems such as toxic algae “blooms”. Zebra Mussels are usually spread when the microscopic larval form known a veliger hitches a ride in something like a live well in a boat. So, just like we are told not to pick up hitchhikers in a car, a few simple precautions next time you are out enjoying the water can ensure the safety of aquatic habitats by preventing Zebra Mussels from making the trip to a new location! However, later breeding ground studies conducted in the western boreal forest and parklands found that selenium concentrations in scaup eggs were below critical levels and that most eggs under observation hatched. Moreover, females on the breeding grounds also had much lower concentrations of selenium in their bodies than those sampled from wintering and staging areas. Why? In a captive study, breeding females quickly eliminated much of the selenium in their bodies once they were no longer fed contaminated food. Because the breeding grounds are generally thought not to be contaminated with selenium, birds with high levels in their body on staging areas likely will reach normal levels by the time they lay eggs. Therefore, it seems unlikely that selenium is causing problems for breeding scaup. But there is still uncertainty about whether it is causing some birds not to reach the breeding grounds, or not to breed when they get there, particularly birds that winter in contaminated areas. Attention then turned to the breeding grounds, and scientists discovered an alarming trend. Wetlands in the northern boreal forest of both Alaska and Siberia were disappearing —quite literally being drained away in some cases. These wetland losses have been linked to climate change, which is thought to be melting the permafrost seal. This seal holds water in many wetlands and lakes, and without it, water drains into the soil over time. Indeed, at several important scaup breeding areas in Alaska, 25 percent of wetlands have disappeared since 1950, mostly in the last 20 years. This habitat change has not been investigated in the heartland of scaup breeding in Canada, but could be occurring there as well. Some wetlands aren’t disappearing because of climate change but are warming up earlier in the spring and getting hotter in summer. Research suggests this change has caused shifts in the types and numbers of aquatic invertebrates in these wetlands, including a reduction in those that female scaup and ducklings prefer to eat. The potential implications are that less food and a poorer quality diet could cause ducklings to grow slower and could delay wing feather development of post-breeding females and young, reducing survival on the southward migration. There is also a possibility that a decline in trapping and furbearer harvest has increased predator populations, and predation on scaup in certain areas. Obviously the scaup story is not finished, and these are definitely birds to watch. According to Fall colour reports early this month, lead colours vary widely by location. Get out and observe what’s happening to the leaves in your schoolyard (see Featured Process from Early October). Trees that are stubbornly green may be non-native, and still tied to the day-length patterns of their native bioregions (e.g. Norway Maple, Common Buckthorn). Northern Saw-whet Owls are migrating and we got to help band these small owls as part of a research study at Trent University to find out more about habitat use and migration patterns. Fine netting is set up at night in a diamond pattern, with a tape recorder playing owl calls in the middle. Nets are checked every half-hour, and any birds untangled, weighed, measured and banded. One bird banded at a site near Bobcaygeon turned up in Port Hope, 60 km south, only 2.5 hours later. The little guy averaged 24 km/hr.! Other interesting individuals were ones that came from distant locations such as Wisconsin, Manitoba, Virginia and Thunder Bay. Common Goldeneye and Bufflehead Ducks, Rough-legged Hawks and even Golden Eagles are arriving, while Turkey Vultures, Cooper’s Hawks and Eastern Meadowlarks are leaving. Yellow-rumped Warblers, however, are still flitting around trees. Our hummingbird feeder hasn’t gone down any more, so our Ruby-throated male, who guarded the thing passionately all summer, has also taken his leave. You can track the hummingbird migration on the Journey North website. Right now, you may still hear some buzzing, though – mosquitoes of the genus Culex are still somewhat active. These mosquitoes overwinter as adults, and need a blood meal to get them through the winter. Any donors out there? Something invisible, but quite remarkable and important, is going on in our lakes right now. As the surface water cools, it approaches the temperature of the deeper water. These two water bodies, kept separate since spring by their temperature differences, can now mix in what’s called the fall turnover (seen here in the context of the annual cycle of a temperate lake), which brings oxygen to the depths and nutrients to the shallows. Turnover will continue until ice over, when no more oxygen will be available until spring melt. The Orionid meteor shower will peak before dawn (why do these things always seem to peak before dawn?) October 21st, so you might want to plan an early morning viewing party for that day. 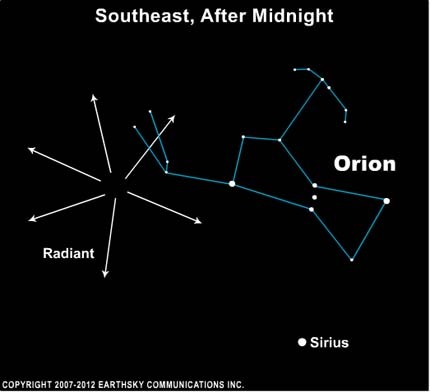 Meteors will come flying out of Orion’s club at a rate of up to 15-20 per hour, and will be better after the moon sets. Look to the southeast or south, depending on time of night. The meteors are debris from Halley’s Comet, left behind in its orbit, which crosses Earth’s in October. Try on the 20th or the 22nd if the 21st projects to be cloudy. The moon goes visiting again, with Jupiter the 10th-12th, and Saturn and Mars the 14th-18th.